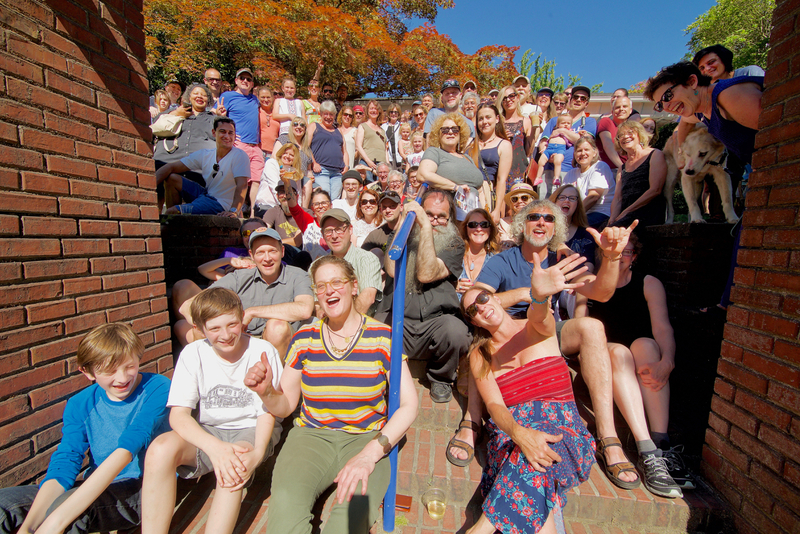 The friends and supporters of C & P Coffee were all there on June 17 (or at least it seemed that way) to enjoy the huge Thank You party they threw for those who helped them save the business. It wasn't advertised on social media. Maybe because the people in West Seattle who love C & P Coffee were already a family of sorts and shared the invitation to the big "thank you" party thrown by Cameron and Pete Moores to express their gratitude. On Sunday June 17, hundreds came to get their free beverages and tacos from Marination Mobile and enjoy cake and cupcakes from Baked Bakery, hear great music, so typical of the place and just hang out with each other. The business was facing a move since the owners of the 1915 bungalow had chosen to sell it. That meant either riding it out and then seeking a new home, somewhere in West Seattle, or simply shutting it down. The third option? Raise the 1.2 million being asked for the house and property. It's location on California Ave SW, on a popular bus line, drove up its value in property crazy Seattle. So Cameron and Pete Moores chose to try. What they didn't anticipate is the enormous amount of goodwill they had built. People seemed to come out of the woodwork Cameron said, as the couple both said they were incredibly moved by the overwhelming and sustained support they got. A GoFundMe page they set up almost instantly topped $10,000, then $20,000, then $30,000 finally topping out at $77,240. Through other investors they managed to get the amount necessary to make the purchase. They shared their feelings previously in an open letter to the community. But Sunday was about giving back. At one point so many people had crowded into the small space it was impossible to walk through but when asked to step outside for a group photo, everyone that wanted to showed up in front and presented their best West Seattle smiles. C & P Coffee proved once more that they are much more than a coffee shop. They part of the beating heart of the community. Leopoldo Seguel, a founder of PoetryBridge Association of West Seattle, invited twelve poets from the PoetryBridge community to collectively write this poem celebrating the C & P Coffee community coming together to save this community treasure from being sold so it could remain a community gathering place for all of us to enjoy and participate forever! C&P has been our poetry home for monthly readings for over seven years. The poets below played Exquisite Corpse--each wrote two lines to follow two lines that had been written by another poet, but only saw the other poet's second line. We hope you enjoy the result. C & P beckons: come hither, meet a friend, raise a glass, chill. C & P's kindness reigns over all, happy or blue. Left to right: Paul Nelson, Koon Woon, Claudia Castro Luna, Michael Hickey, Janet Yoder, Christopher Jarmick, Cheryl Latif, David Fewster, Judith Camann, Arleen Williams, Pamela Carter and Brandon Pitts.